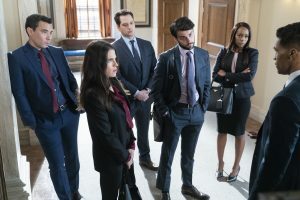 WARNING: The following article contains spoilers for Episode 12 for Season 5 of How To Get Away With Murder titled “We Know Everything”. Do not read if you have not seen the episode or read ahead at your own risk. 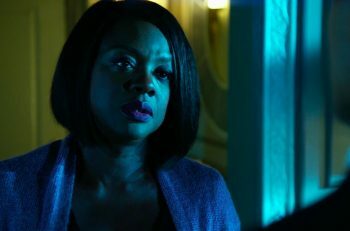 Annalise Keating and her students have been getting away with murder for five seasons now, but Thursday’s episode revealed the walls are beginning to close in on the former law professor. 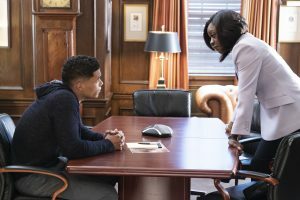 The episode kicks off with Annalise (Viola Davis) agreeing to be Gabriel’s (Rome Flynn) lawyer, but at this point, she does not know why he is being charged. Fast forward and it is revealed that it was domestic terrorism charge. The police ID’d him from a 2014 photo where he attacked a police officer with a chemical agent. The only problem is the individual in the photo was wearing a mask. Gabriel later admits to Annalise that it is him in the photo and later the charges are dropped. This makes him both happy and upset. He’s happy because he avoided jail (for now) and uncovered that the FBI agents planted evidence in his apartment. He’s upset because the only reason this was uncovered is because Frank (Charlie Weber) hid a camera in his apartment to spy on him. If you thought that was all, you’d be mistaken; not with this show. Agent Claire Telesco (Melinda Page Hamilton) tells Gabriel she just wanted to grab his attention and her real goal is to turn him against Annalise. In exchange, she will give him full immunity. Will he go through with it? More on that in a moment. Meanwhile, Nate (Billy Brown), Bonnie (Liza Weil), and Frank are working to find Miller’s connection to Governor Birkhead so that they can have her take the fall for Nate Sr.’s death. However, the only thing they can find to connect the two is a Cleveland phone number that Miller called. That number was to Maria Sloane, the woman from Cleveland’s Department of Child Services, the same woman who told Annalise she could not adopt Wes all those years ago. It seems Miller passed this information along to the Governor and that’s why she used it against her last season. Opening old wounds for Annalise now isn’t the best idea. At this point, Gabriel is the only one who can help Annalise. They can’t go to the FBI with the information that Nate & co. found because it will only link her to Wes, which is not good for anyone right now. So Annalise comes clean to Gabriel about everything, telling him about the attempt to adopt Wes and Birkhead finding out. Since she kept him from going to jail, he owes her. Gabriel goes to Agent Telesco and tells her a story about how he heard Miller talking to someone about the adoption. “Someone named Lynne,” he says. And that’s Governor Birkhead. Telesco feels she is being played, and let’s face it: she is right. 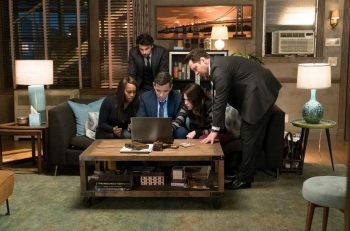 But as we see, the FBI is trying to link everyone together and Annalise is right in the middle; this doesn’t look good. It also gives a major hint the show is nearing its end if the FBI is on to Annalise and every single person she’s associated with. As the episode ends, Miller’s body is discovered, thanks to Nate’s anonymous tip. The Keating Five is watching it unfold on TV and the police went to Birkhead’s home. Great news, right? Wrong. Asher gets an Instagram notification that Connor’s mom posted a photo of them and Nate is clearly in the background talking to Miller. Ugh. Doesn’t anyone believe in photo editing apps? This is why older people should not be on social media, especially on this show! Teagan met with Telesco in the episode to discuss Miller’s disappearance and is shocked to find out Annalise might have had something to do with it. To throw her off the scent, Michaela decides to have Connor create a fake email to scare her that the FBI got her “Jane Doe” name exposed. What did you think of the episode? Let me know in the comments below! Next article ‘Celebrity Big Brother’ recap: Kandi finally makes her move but will she get her way?